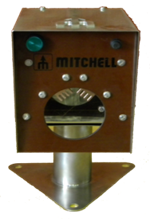 12 bird stunner/bleeder is manufactured for the small to medium size poultry abattoir. Handling up to 800 birds per day. This poultry processing equipment comprises a stunner head, 2 bleeding cones and a drain trough. By inserting the live chicken head into the stunner onto the electrodes it is stunned unconscious. Two voltage selections 110 and 140 volts are available for different bird types. The stunned birds are then put into the 2 x 6 bird cones, head first and their necks cut to bleed out. The blood drips into the lower trough and is then drained into a collection container.